The “Blog” of “Unnecessary” Quotation Marks: insert my WHAT in WHERE? Nathan writes, "I had to get an xray recently. Had some trouble with the gown." 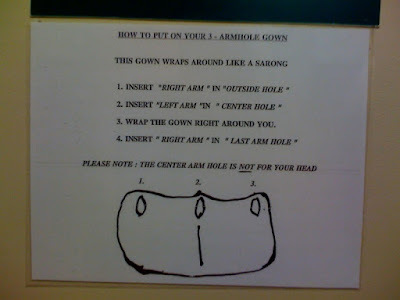 These instructions are much more fun when sung to the tune of THE HOKEY POKEY: "You put your left arm in, right in the left armhole..."
".... and shake it all about..."
I wonder if this is located in a prosthetics clinic? Then it might actually be appropriate. My favorite part: "The third armwhole is not for your head."